Bevo the University of Texas longhorn mascot. One of the more bizarre events in Texas collegiate history took place in Austin on a January night in 1920. The occasion was a tribute to Bevo, the University of Texas' longhorn mascot. More than 200 "wearers of the T" and their guests attended a feed at the men's gymnasium in the steer's honor. The UT football team had been called the Longhorns since 1904, but another 12 years went by before an orange-blooded alum (class of '11) decided the school needed a flesh-and-blood longhorn stomping around on the sidelines during football games. Steve Pinckney, referred to in one newspaper account as "the grandfather of the Longhorn steer," collected $1 from 124 UT graduates to buy the brute. 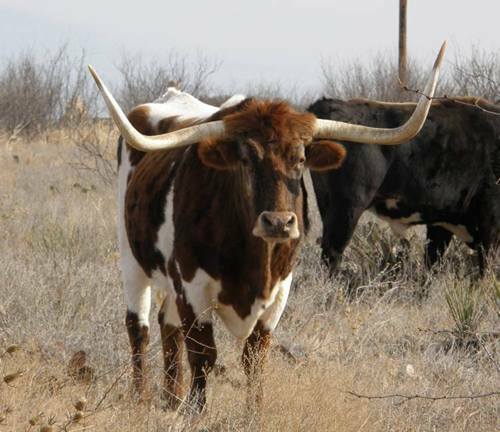 The transaction occurred in the Panhandle, where the seller loaded the longhorn onto a cattle car for shipment to Austin. This longhorn already had an impressive history. The steer had been captured by a posse of Texans in a raid on Mexican cattle rustlers near Juarez in the fall of 1916. Presumably, the animal had been stolen from the Texas side of the river some time prior to his repatriation. Pinckney presented the well-traveled steer to the UT student body on Thanksgiving Day 1916. The two-legged Longhorns went on to defeat Texas A&M 21-7, avenging a 13-0 loss to the Aggies the year before. For a time there was talk of branding the steer with a big T and the numbers 21-7, but the notion was overridden as cruel. The holidays came and went and then it was February. On the morning of Feb. 11, 1917 the owner of the stockyard where the longhorn was kept made a startling discovery: Intruders, presumably Aggies, had slipped up on the penned mascot and used a red hot running iron to sear the 13-0 score from 1915 on the steer's flank. The steer's embarrassed student handlers, in turn, soon came up with a clever way to save face for their school, though it was a little hard on their mascot. The UT partisans converted the 13 into a B, the hyphen into an e and inserted a V in front of the zero. That spelled Bevo, the brand name of a popular near beer. But that was all history three years later when UT students and supporters gathered to honor their twice-branded mascot, now well known as Bevo. Dr. Charles W. Ramsdell, master of ceremonies at the event, introduced Dr. Robert E. Vinson, president of UT. Vinson went on to give a flag-waving oration concerning "the qualities of the true American citizen." Though the university faculty was doing its best, in Vinson's judgment civilization "thus far has failed to develop to the fullest the three essentials of true manhood and womanhood - the spirit, the mind, and the body." As perhaps only a highly educated academician could do, the UT president came up with a way to claim that Bevo "typified all three qualities." Dropping the bull metaphor, he concluded his remarks with the assertion that "education should broaden the student in all three essentials." Next to speak was Pinckney, who related the steer's colorful pedigree. He was followed by Tom Inglehart, Bevo's custodian for the past three years. Finally, aptly named Alfred Bull stood to tell how Bevo got his name. After that, the celebrants were treated to rope tricks, a wild Indian act and music. Where was Bevo while all the speechifying in his honor went on? Well, to paraphrase the modern beef industry, Bevo...he's what's for dinner. The headline in the next day's Austin newspaper pretty well summed it up: "Famous Longhorn Steer Is Eaten By Varsity Students: Bevo of Fond, But Sometimes Unpleasant, Memories, Served At Barbeque." The newspaper story went on to say that the demise of the steer (why Bevo was available to barbecue was not explained) marked the end of a tradition, which just goes to show the importance of not believing everything you read in the newspapers. Bevo I's descendant, Bevo XIII currently reigns as one of college football's most notable mascots. But so far as is known, the gathering that winter evening in 1920 marked the only time Bevo ended up in a barbecue pit.